The Department for Work and Pensions (DWP) is failing to support “vulnerable” claimants and is unable to monitor how they are being treated under its new universal credit benefit system, according to an investigation by the public spending watchdog. 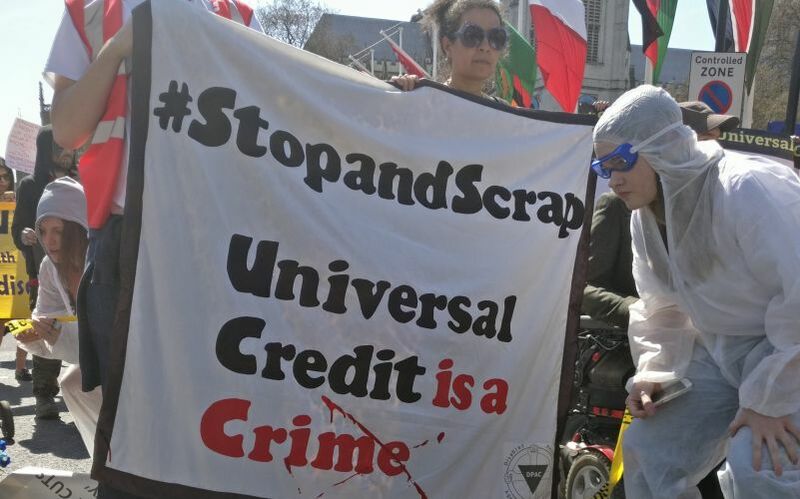 The report by the National Audit Office (NAO) raises a string of serious concerns about the way vulnerable claimants are being dealt with by DWP as it gradually rolls out universal credit across the country. It follows years of revelations by Disability News Service (DNS) and others concerning links between DWP’s social security cuts and reforms and the deaths of disabled benefit claimants seen as vulnerable by the department. There was widespread media coverage last Friday of NAO’s damning conclusions that universal credit – which is replacing six means-tested benefits for working-age households – may cost more than the system it is replacing and has not delivered value for money, with its rollout “considerably slower than was initially intended”. So far, DWP has spent £1.9 billion on universal credit, while it is now six years behind schedule. Despite the criticism, NAO said the government had no “realistic alternative but to continue” rolling it out. But within the 80-page report – which examines DWP’s progress in implementing universal credit – NAO also raises significant concerns about DWP’s failings in dealing with claimants who are in vulnerable situations. Most of these claimants are likely to be disabled people, with many likely to have mental health conditions or learning difficulties. Although DWP has put in place various types of support for those it considers vulnerable, such as help with budgeting and using computers, and allowing payments to be paid more often than once a month, the NAO report says the department has “found it difficult to identify and track those who it deems vulnerable”. DWP has not even measured how many Universal Credit claimants are experiencing problems, because it “does not have systematic means of gathering intelligence” from “delivery partners” such as housing associations and local councils. The NAO report says DWP “lacks the ability to monitor the treatment of vulnerable claimants” nationally and has not developed a way to record “different vulnerabilities” in its data systems. Jobcentre managers told NAO that this “lack of vulnerability identification markers” was making it difficult for them to understand what local support was needed. The report says that identifying vulnerability is important because it allows DWP to target support and set “appropriate conditions on welfare”, for example by easing the conditions they need to meet to avoid having their benefits sanctioned. It says DWP has now “recognised the need to make changes to the way it identifies and provides support to vulnerable claimants”. DWP’s own research last October found that some staff had found it difficult to support vulnerable claimants because they “lacked the time and ability to identify claimants who needed additional support” and “lacked the confidence to apply processes flexibly and make appropriate adjustments”, says the report. They also “felt overwhelmed” by the number of universal credit claimants who reported health problems, says NAO. But when asked how it responded to NAO’s concerns about vulnerability, whether it was concerned about these issues, and if it had any plans in place to address them, DWP refused to comment, providing only a general comment in response to the report*. She added: “The NAO report has supported the view of many campaigners, including DPAC, that universal credit is totally and utterly unfit for purpose and that nothing less than ‘Stopping and Scrapping’ it is the only sensible action. Asked whether DWP was aware of any internal reviews into the deaths of universal credit claimants deemed “vulnerable”, a DWP spokesman advised DNS to submit a freedom of information request. The concerns raised by NAO will raise fears that DWP has learned nothing from the scores of secret internal reviews into the deaths of benefit claimants that have been carried out since February 2012. Last year, DWP admitted to the information commissioner that from February 2012 until September 2015 it kept no records of what happened to recommendations made by the internal reviews. DWP had been unable to say whether it implemented 10 separate recommendations on improving the safety of vulnerable disabled people, following the deaths of six benefit claimants. All six disabled people had applied for the out-of-work disability benefit employment and support allowance through the work capability assessment process. *The DWP spokesman said: “Previous administrations poured billions into an outdated system with a complex myriad of benefits, which locked some people into cycles of welfare dependency. “Whereas we are building a benefit system fit for the 21st century, providing flexible, person-centred support, with evidence showing universal credit claimants getting into work faster and staying in work longer. “Furthermore, 83 per cent of claimants are satisfied with the service and the majority agree that it ‘financially motivates’ them to work. “The NAO report fails to take into account the impact of the improvements we have made recently as part of our ‘listen and learn’ approach to the rollout of universal credit. “These changes include the abolition of waiting days, making 100 per cent advance payments available from day one, and introducing two weeks additional housing cost support for people joining universal credit from housing benefit.